We are proud to announce our Fall Meeting – Widely regarded as the Greatest Professional Wrestler of All Time and the Best American Performer of the 1980’s! Recognized officially as the 16-Time World Champion!! – “The Nature Boy”!!! We are proud to announce our spring meeting and what a treat we will have for you. Coming off a great season, one of the Carolina Panthers all time Fan Favorites, All-Pro, 2013 NFL Defensive Rookie of the Year, 2014 NFL Defensive Player of the Year and a terrific team player!!!! Luke Kuechly is an American football Linebacker for the Carolina Panthers of the National Football League (NFL). He was recognized twice as a consensus All-American while in college. Luke Kuechly was born on April 20, 1991, in Cincinnati, Ohio. He grew up in Evendale, Ohio. He played college football at Boston College and was recognized twice as a consensus All-American. He was drafted by the Panthers ninth overall in the 2012 NFL Draft. He was drafted by the Carolina Panthers in the first round: the first linebacker selected and the 9th overall pick. On May 10, 2012. He signed a 4-year, $12.58 million contracts. On September 10, 2015, Kuechly signed a 5-year, $62 million extensions with the Panthers, becoming the NFL’s highest-paid middle linebacker by annual average salary. Luke Kuechly became the youngest recipient of the AP NFL Defensive Player of the Year Award in its history in 2013. Meetings of the Hickory Sportsman’s Club are closed to only members and their guests. Four-time NASCAR CUP SERIES champion Jeff Gordon, one of the most iconic names in racing and pop culture, returns to FOX NASCAR in 2017 as a race analyst for the second consecutive year. Gordon, who sits third on NASCAR’s all-time wins list with 93 victories, calls MONSTER ENERGY NASCAR CUP SERIES races for FOX NASCAR alongside play-by-play announcer Mike Joy and analyst and Hall of Famer Darrell Waltrip. The California native, one of the most versatile drivers of his era, is credited with helping take NASCAR mainstream in the 1990s. Gordon changed the face of NASCAR, shattering stereotypes and drawing legions of new fans with his talent, poise and polished appearance that also made the sport attractive to Madison Avenue. In his 23 years of full-time Cup Series competition, Gordon served as one of NASCAR’s most effective and committed ambassadors. Gordon drove for Hendrick Motorsports for his entire Cup Series tenure, from November 1992 through November 2015, winning four Cup Series championships (1995, 1997, 1998 and 2001), 93 races and 81 pole positions, and scoring 325 top-five and 475 top-10 finishes. With his first title in 1995, Gordon became the youngest champion (24) in NASCAR’s modern era in only his third full season. After retiring from full-time competition in November 2015 as one of only a few athletes to step away at the pinnacle of their respective sports, Gordon returned in late 2016 for eight Cup Series events as a substitute driver for former teammate Dale Earnhardt Jr., who was recovering from a concussion. Gordon ranks third behind only NASCAR Hall of Fame drivers Richard Petty (200) and David Pearson (105) in all-time victories, is a three-time DAYTONA 500 champion and record five-time BRICKYARD 400 winner. Gordon holds the record for most consecutive seasons with a pole (23), among numerous other accolades. Furthermore, he is NASCAR’s winningest road-course driver with nine wins and is the all-time leader with 12 restrictor-plate track victories. In September 2015, Gordon set a record for most consecutive starts with his 789th race, breaking Ricky Rudd’s mark of 788 and joining the “iron man” company of legends such as Cal Ripken Jr. and Brett Favre. Gordon, who was named one of “NASCAR’s 50 Greatest Drivers” in 1998, tallied 797 consecutive starts, a journey that began with the 1992 season finale at Atlanta Motor Speedway as Petty brought his racing career to a close. In preparation for his role as FOX NASCAR analyst, Gordon served as a race analyst for FOX Sports’ coverage of three NASCAR XFINITY SERIES in 2015. His move to the FOX booth furthered a career in which his affability and crossover appeal provided him numerous high-profile television and movie opportunities that include: becoming the only auto racing driver ever to host Saturday Night Live; co-hosting Live! With Regis and Kelly more than 10 times; appearances as himself on The Simpsons, Spin City and The Drew Carey Show; movie appearances in Taxi, Herbie: Fully Loaded and Looney Tunes: Back in Action; TV appearances on Late Show with David Letterman, The Tonight Show with Jay Leno, Jimmy Kimmel Live! and Sesame Street; and participation on television’s Celebrity Poker Showdown and Who Wants to Be a Millionaire: Sports Edition, among others. Gordon also voiced the character “Jeff Gorvette” in the animated film Cars 2. In January 2017, Gordon became the first NASCAR Cup Series champion to win overall at the 24 Hours of Daytona and only the fourth driver in history to win the Rolex 24 and the Daytona 500, joining the elite company of A.J. Foyt, Mario Andretti and Jamie McMurray. In his second appearance in the Rolex 24, Gordon co-drove the No. 10 Cadillac for Wayne Taylor Racing in the debut race for the brand-new Cadillac DPi-V.R. The endurance classic marked Gordon’s return to sports cars for the first time since 2007, when he also competed for Wayne Taylor Racing, notching a third-place finish. Off the track, Gordon established the Jeff Gordon Children’s Foundation in 1999, which supports pediatric cancer research, treatment and patient support programs and has granted more than $16.5 million to support children battling cancer. Additionally, Jeff Gordon Children’s Foundation provides support to the Jeff Gordon Children’s Hospital in Concord, N.C., which serves children in the community by providing a high level of primary and specialty pediatric care to all of their patients, regardless of their ability to pay. Jeff Gordon Children’s Foundation provided $1.75 million to establish the Butaro Cancer Center of Excellence (BCCE). Working in collaboration with Partners in Health, Dana Farber Cancer Institute and the Ministry of Health of Rwanda, BCCE opened its doors in July 2012 and has treated more than 5,000 patients who otherwise would have no access to care. The country now boasts one of the highest-achieving cancer programs on the continent and is the only rural cancer center in East Africa. In 2011, Gordon was invited by President Bill Clinton to join the Clinton Global Initiative. The Clinton Global Initiative convenes global leaders to create and implement innovative solutions to the world’s most pressing issues. At the industry’s December 2015 NASCAR Cup Series Awards in Las Vegas, Gordon’s final as a full-time driver, actor and friend Tom Cruise surprised Gordon and introduced him on-stage preceding Gordon’s receipt of the illustrious Bill France Award of Excellence and his final speech as a driver. Born Aug. 4, 1971, in Vallejo, Calif., Gordon grew up in Pittsboro, Ind. He currently resides in Charlotte, N.C., with his wife, Ingrid Vandebosch, daughter Ella and son Leo. For more information on Gordon, please visit http://jeffgordon.com/ or follow him on Twitter at @JeffGordonWeb. Known around the league as a teacher with an innate ability to build his team around the strengths of his players, two-time NFL Coach of the Year Ron Rivera inherited a 2-14 Carolina team as a rookie head coach in 2011 and has quickly guided it back to relevance in just five seasons. In 2015, the Panthers captured their third consecutive NFC South title, claimed the top seed in the NFC, won the second NFC Championship in franchise history and appeared in Super Bowl 50, and Rivera was named NFL Coach of the Year for the second time in three years. Carolina finished the season with a franchise-best 17-2 record, including postseason victories over Seattle in the NFC Divisional Playoff and Arizona in the NFC Championship, and became just the seventh team in the Super Bowl era to post a 15-1 or better record in the regular season. The Panthers are one of four teams to reach the divisional round of the playoffs each of the last three seasons. All current members should receive your letter formally announcing Coach Ron Rivera in early April. Guests spots will be limited to the first 40 received.. The Hickory Sportsman’s Club is pleased to announce that ESPN College Football Analyst Lee Corso will be our featured guest for our Fall 2016 meeting. One of college football’s most knowledgeable, opinionated and entertaining analysts, Corso is a key member of ESPN’s college football team, serving as an analyst on the six-time Emmy-Award winning College GameDay, the network’s signature Saturday morning show originating from the site of one of the day’s best games. Corso, who joined ESPN in 1987 and is the only original College GameDay on-air personality (he was a contributor in 1987-88 and joined as an analyst in 1989). He joined ESPN after 28 years as a coach at the college and professional levels, including 17 seasons as a head coach. Corso was head coach of the Louisville Cardinals for four seasons (1969-72), and in that short span took the Cardinals to the 1970 Pasadena Bowl. It was the first Louisville football bowl appearance since 1958. During his time at Louisville, Corso compiled a 28-11-3 mark and captured two Missouri Valley Conference Championships (1970 & ’71). He then moved to Indiana in 1973 where spent 10 seasons as the head coach of the Hoosiers, leading the school to their first bowl victory in 75 years, a 38-37 decision over previously unbeaten Brigham Young in the 1979 Holiday Bowl. Corso coached Northern Illinois in 1984 before taking over the reins of the Orlando Renegades of the United States Football League (USFL) in 1985 for one season. He began his coaching career as an assistant coach for 11 seasons (1958-68) at Florida State, Maryland and Navy. In addition, from January-July 1991, Corso served as General Manager of the World League’s Orlando Thunder. Corso has been honored with two prestigious awards: the US Sports Academy Ronald Reagan Media Award given to those who have made outstanding contributions to sport through broadcasting, print, photography or acting and the National College Football Awards Association Contributions to College Football Award recognizing exceptional contributions to college football and a lifetime of achievement and integrity. He also received the 2011 Jake Wade Award presented to an individual who has made an outstanding contribution in the media to the field of intercollegiate athletics. In 2012, Corso received many additional honors: the Over the Mountain Touchdown Club Lifetime Achievement Award; earned an Honorary Doctorate and was the commencement speaker at Florida State; and was named the Liberty Bowl Distinguished Citizen Award. 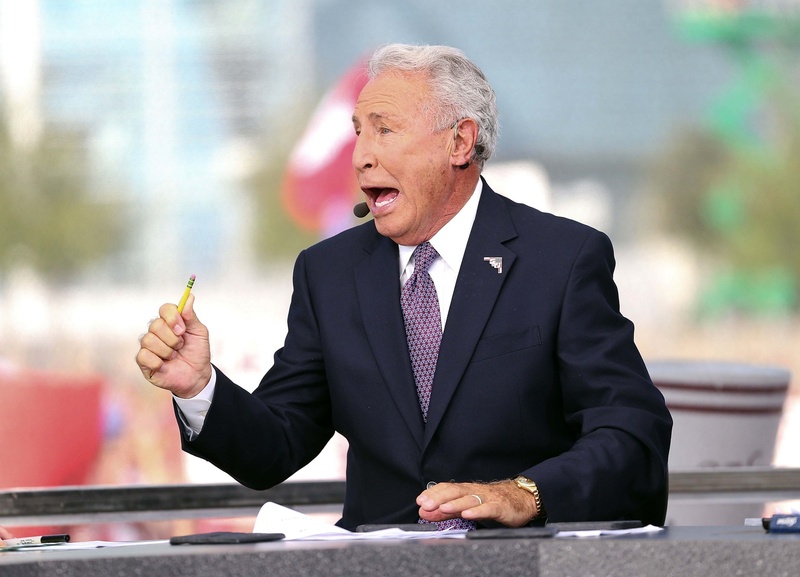 As College GameDay’s national appeal has grown, Corso’s opinions, analysis and daring predictions have become one of the most anticipated in sports television. In 2001, Sporting News magazine selected Corso as the 17th most influential person in college football. The magazine in January 2004 ranked Corso and fellow GameDay hosts – Chris Fowler and Kirk Herbstreit – as 2003’s “Most Powerful Media Personalities in Sports.” GameDay has won a Sports Emmy in 2007, 2009 and 2010, and received nominations for Sports Emmys in 2000 and 2003 and for CableACE Awards in 1994, ’95 and ’97. In 2006, College GameDay received the National Football Foundation & College Hall of Fame’s Outstanding Contribution to Amateur Football Award. Corso received four varsity letters in both football and baseball at Florida State and Louisville. He is a member of the Hall of Fame at Florida State and the University of Louisville. Corso was also inducted into the state of Florida Sports Hall of Fame in St. Petersburg and most recently into the Kentucky Athletic Hall of Fame. In 2006, he received the Florida State Alumni Association’s Gold Medal, the highest alumni honor. A graduate of Florida State, Corso earned a bachelor of arts degree in physical education and a master’s degree in administration and supervision. Corso is director of business development for Dixon Ticonderoga, Heathrow, Fla., an international diversified manufacturer and marketer of writing and arts products. Monday, November 7th – Rock Barn Golf and Spa. Meetings of the Hickory Sportsman’s Club are only open to members of the Hickory Sportsman’s Club and a limited number of members’ guests. The Hickory Sportsman’s Club is pleased to welcome Carolina Panthers Tight End Greg Olsen as our featured speaker for the Spring 2016 meeting. Gregory Walter Olsen is an American football tight end for the Carolina Panthers of the National Football League. He played college football at the University of Miami, and was drafted by the Chicago Bears in the first round of the 2007 NFL Draft. On July 28, 2011, Olsen was traded to the Carolina Panthers for a 2012 third round draft pick. During his first year with Carolina, Olsen was targeted by Cam Newton on 45 receptions for 540 yards. He also recorded 5 touchdowns. In the 2014 NFL season, Olsen had 14 receptions on 19 targets without a drop this season. Olsen has not allowed a pressure in his 35 pass-blocking snaps. Through the first six weeks of the season, PFF has rated Olsen as the best tight end in pass block efficiency and receiving. Through the first 7 weeks of the season, Olsen led all tight ends in receiving yards with 493, and had recorded at least five catches and 60 yards receiving in all but one game throughout the year. Olsen finished the regular season with a career-high 84 catches, 1,008 receiving yards, as well as 6 touchdowns en route to the Panthers second consecutive NFC South division title. Olsen finished third in the NFL for receptions by a tight end and second for both yards on the season and yards per game. It was Olsen’s first 1,000 yard receiving season. For his efforts during the 2014–15 season he was voted to the 2015 Pro Bowl. Playing for Team Carter, Olsen had three receptions for 53 yards and two touchdowns. On March 5, 2015, The Carolina Panthers signed Olsen to a three-year extension worth $22.5 million. The extension includes a $12 million signing bonus with an average annual salary of $7.5 million, according to Olsen’s agent Drew Rosenhaus. During the Panthers week three matchup against the New Orleans Saints, Olsen caught 8 passes including two touchdowns and a career high 134 receiving yards. He also tied a career long reception of 52 yards. Through the first four weeks of the season Olsen had 17 receptions for 243 yards and 2 touchdowns. Olsen continued his high level of play during a week 6 matchup against the Seattle Seahawks. Olsen caught 7 catches for 131 yards along with a game winning touchdown with under a minute to play. The touchdown helped keep the Panthers undefeated season alive as they improved to 5–0 on the season. Olsen played well against the New Orleans Saints again later in the season. Olsen recorded 9 reception, including one on 4th down during the Panthers final drive, and 129 yards. Through the first 13 games of the year Olsen recorded 65 receptions for 969 yards and 6 touchdowns. During the 2015 season Olsen set Panthers records for career receiving yards and receptions for a tight end, both were held by former Panther Wesley Walls. During the Panthers’ 41-38 victory over the New Orleans Saints to improve them to 12–0, Olsen caught nine passes for 129 yards and, during the game, passed Wesley Walls for most career receptions by a TE in Panthers’ history. Tuesday, May 17th – Rock Barn Golf and Spa. Meeting is only open to members of the Hickory Sportsman’s Club and a limited number of members’ guests. Rob O’Neill is one of the most highly decorated combat veterans of our time. He was a team leader with the Naval Special Warfare Development Group. He has deployed more than a dozen times, and he held combat leadership roles in more than 400 combat missions in four different theaters of war. A highly trained Navy Seal, he led the military’s most elite and was involved in our nation’s most important campaigns. He was one of the quiet professionals performing the most difficult tasks in the most difficult circumstances, servicing his remarkable career in the shadows and keeping America safe in the process! A True American!!! Monday, October 26th – Rock Barn Golf and Spa. Meeting is only open to members of the Hickory Sportsman’s Club and a limited number of members’ guests. You asked and we have delivered again!!! We are very fortunate to be bring to the HSC the Collegiate Football Hall of Famer, NFL MVP Quarterback, Father of two premier Quarterbacks in the NFL today and two Super Bowl MVP’s. Jay Bilas, ESPN broadcaster and attorney, is one of basketball’s strongest voices. He joined ESPN as a college basketball analyst in 1995 and today serves as game and studio analyst, working more than 40 games a season and co-hosting ESPN’s popular road show, College GameDay. He also is a regular contributor to SportsCenter, ESPN.com, ESPN The Magazine and ESPN radio, and he provides commentary on coverage of the NBA Draft and NCAA Final Four. Bilas is a two-time Emmy nominee for Best Studio Analyst and in 2010 was named Best Game Analyst by Sports Illustrated. He received “Best Column of the Year” from the US Basketball Writers Association and the “Distinguished Young Alumni Award” from Duke Law School. The 6’8” Bilas was a four-year starter for Mike Krzyzewski at Duke from 1982-86. He finished his career with 1,062 points, 692 rebounds, and was third among Duke’s all-time career field-goal percentage leaders (56 percent). As a senior, Bilas was a starter on the 37-win Duke squad that played in the 1986 NCAA Championship game. He graduated from Duke with a degree in political science in 1986 and from Duke Law School in 1992. He has been litigation attorney with the Charlotte, N.C., firm of Moore & Van Allen, PLLC since 1992. Bilas was one of two student-athletes in the nation appointed to the NCAA’s Long-Range Planning Committee (1984-86). He appeared on CBS’s Face the Nation on April 7, 1985 to discuss academics and athletics. During summers, he worked as a production assistant for ABC Sports, which included stints at the 1983 PGA Championship, the 1984 Summer Olympics in Los Angeles and in 1984 and 85 with Monday Night Baseball. A 1986 NBA draft pick of the Dallas Mavericks, Bilas played professionally in Italy (1987-88) and Spain (1989) before returning to Duke as an assistant coach from 1990-92. The Blue Devils made three NCAA Championship Game appearances during his tenure as a coach, winning the championship in ‘91 and ‘92. A member of the Screen Actors Guild, Bilas has appeared in various commercials, an episode of the television show The White Shadow and had a feature role in the 1989 Columbia Pictures movie I Come in Peace. A native of Rolling Hills, Calif., Bilas averaged 23.7 points and 13.5 rebounds as a senior at Rolling Hills High School. HSC members and their guests will enjoy an entertaining evening from one of golf’s most comical, yet enlightening television analysts.